Tracking the rise of our robot overlords. 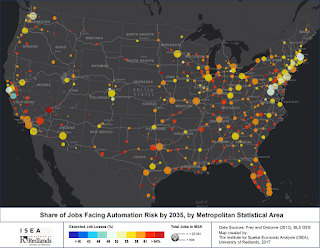 By 2037, 65 percent of jobs in Las Vegas, Nevada may be automated. 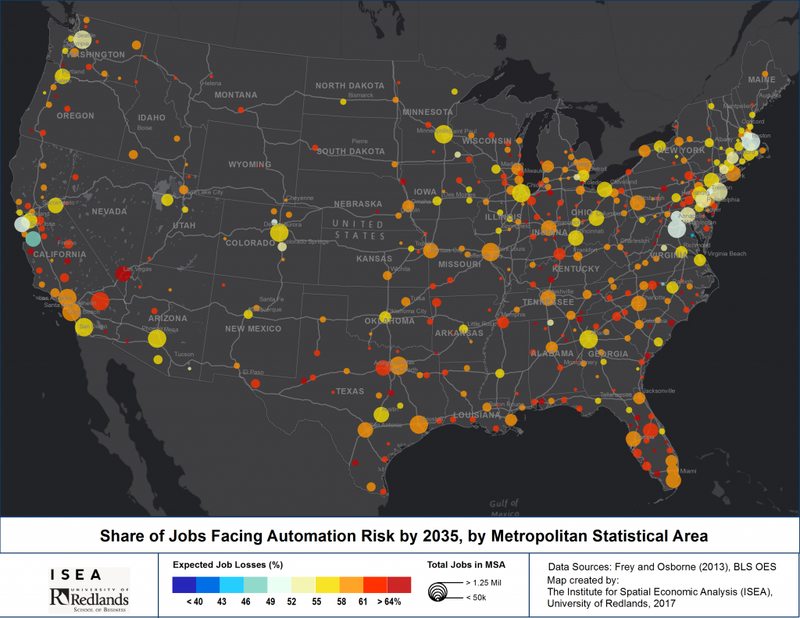 That is the conclusion of a report by the Institute for Spacial Economic Analisis (ISEA) which looked at the jobs likely to be automated and how that would impact specific cities and regions in the US. Las Vegas topped the list at 65.2% followed by El Paso, Texas (63.9%), Riverside-San Bernardino, California (62.6%) and Greensboro-High Point, North Caronline (62.5%). The first figure below shows how various places will fare, but even the cities that will be least impacted are looking at 30-40% job loss. Of course, the disparity in incomes combined with the fact that low paying jobs will be hit the hardest, means that a 50% drop off in jobs doesn't mean a 50% drop off in overall income for a location. This next figure shows the likely economic impact of all of those job losses. 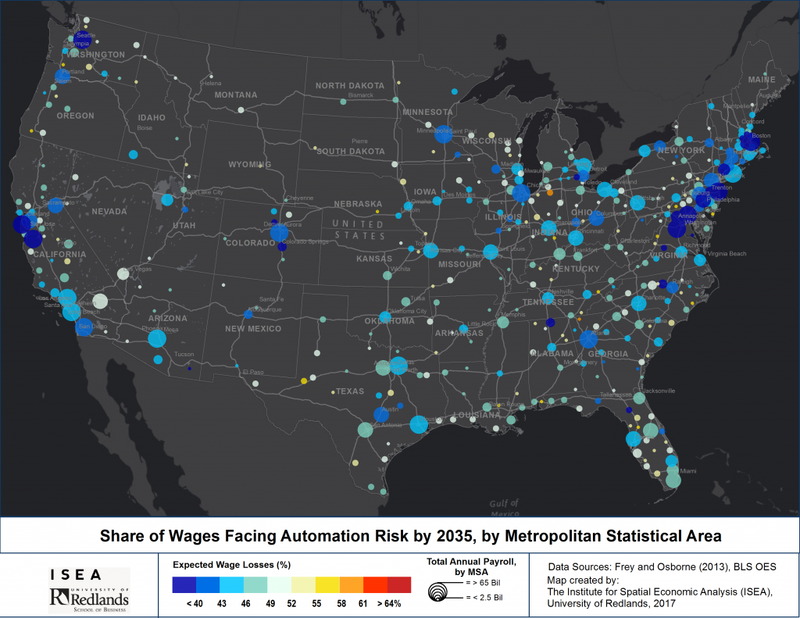 The researchers say that they do not discount the idea that automation will likely create some jobs in some areas but, given that this will disproportionately hit lower skilled and lower paid workers, they are unsure whether an adequate number of jobs will be created. 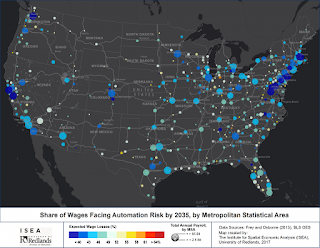 In their ongoing work, the team will attempt to go into more depth on who the likely winners and losers of automation will be and will look at jobs by education level, race, age and gender. For more info on the report visit iseapublish.com. Is Google's Eric Scmidt a robot 'job elimination denier'? Not really. When will robots take over food delivery? Would you trade your doctor for an app?